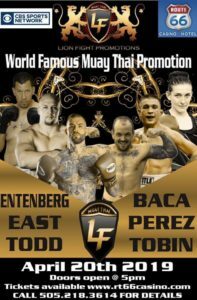 LFA 55 takes place at the Bomb Factory in Dallas, Texas, on November 30th, main card televised on AXS TV. 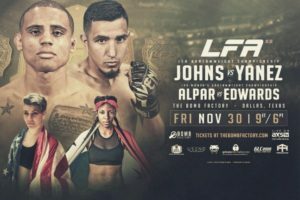 The night headliner will see two of Texas’s top Bantamweights battling for the LFA crown as Fortis MMA’s Miles Johns (7-0) collides with Metro Fight Club’s Adrian Yanez (7-2). Johns a 24 year old from Dallas, who’s coming off submitting Eric Ellington at LFA 40. Houston’s Yanez turns 25 the day before the fight, and has won consecutive fights over Trent Meaux (UD) & Natha Trepagnier (KO). In the co-feature Sarah “Too Sweet” Alpar (7-4) & Joseleyne “La Pentara” Edwards (8-1) square off for the vacant LFA women’s Bantamweight title. 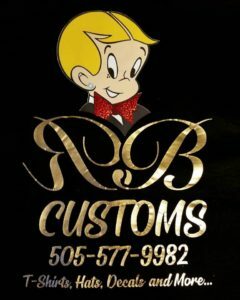 Alpar 27,will be fighting for the first time in just over a year, since winning the SCS Bantamweight title, with a first round TKO of Pamela Boveda Aguirre. Edwards 23, has won 7 straight, 6 by stoppage, most recently submitting Brenda Gonzales-Means with an armbar at KOTC: Aggressive Lifestyle, winning The Fight Series & KOTC 135 titles in the process.